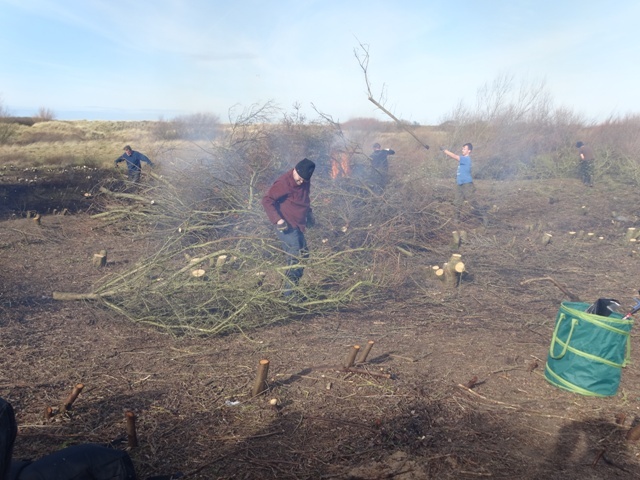 Yesterday I had a tiring but fun day helping out the Amphibian & Reptile Group of South Lancashire in sand dune habitat outside Southport, where we were working to improve the habitat for the local sand lizards. We didn’t actually see any sand lizards (Lacerta agilis): they’re all still in hibernation. As was explained to us on the day, these lizards have quite a long life cycle: males only come out of hibernation in March, females in April. After mating, the females will then lay eggs in May/June, which will only hatch in August/September. This means the babies only have a limited time to feed and bulk up before going into hibernation; adding to the problem is the large number of predators that will cheerfully eat them, including adult sand lizards! Sand lizards are rare in Britain today, mainly due to habitat loss. With such high infant mortality and limited dispersal capabilities, they need plenty of help, through captive breeding and habitat management. The objective of this day was to get rid of some scrub to create more open sand dune habitat, which the lizards need for basking and laying their eggs. 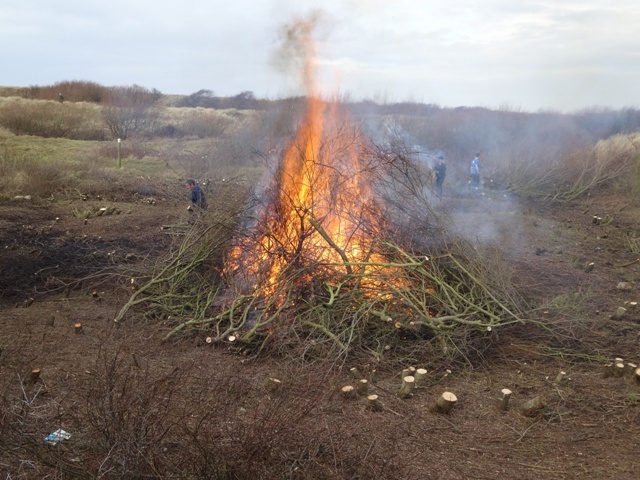 Thus, the day largely consisted of dragging branches and throwing them on a bonfire, which a few passing members of the public didn’t approve of. One woman raised the possibility that there might be hibernating animals (or possibly John Watson) inside the bonfire – never mind that we had only constructed it that morning. Feeding the fires was certainly satisfying, but the smoke made things difficult, particularly around one bonfire that was constructed right in a sand dune bowl, sending smoke constantly blowing right where we were dragging the wood from! It was still a fun day overall, though, and with so many people there, we cleared an awful lot of scrub. So here’s hoping for a good year for the Merseyside sand lizards! This entry was posted in Nature and tagged ARGSL, conservation, herpetology, lizard, sand lizard. Bookmark the permalink.